Only another day before I draw the winner of the mermaid! Leave a comment either on this post or the one just below! Also, go to Sew Mama Sew and see all of the sites (over 400) that are hosting giveaways. In the event that you are not the winner, check out my etsy site. I have a blue one listed there. This is my first give away and I'm so excited! 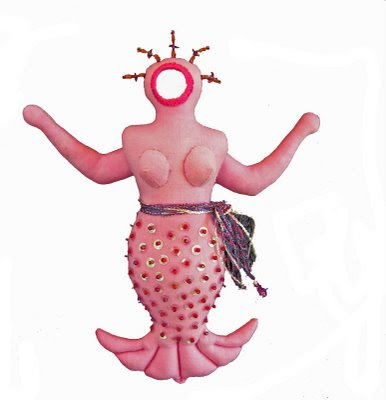 I'm giving away this sweet little pink mermaid. 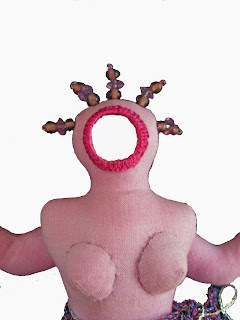 She is approximately seven inches long and is made from hand-dyed, cotton fabric. 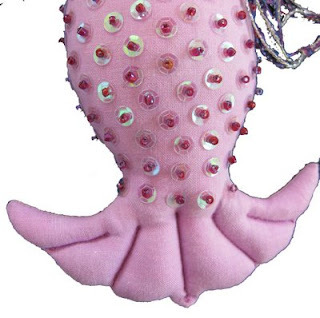 She has a beaded and sequined tail and beads adorn her head. Her face is a mirror, so when you look into her face...you are the mermaid! Just leave a comment on any of my posts this week before midnight (CST) on May 31 and you will be eligible to win. The winner will be chosen randomly and notified on June 1. Because this is my first time doing a giveaway, I'm keeping it simple and will be mailing only to the U.S. or Canada. Please be sure to include contact information in your comment. Good Luck!!! Here at Threads of Inspiration there is excitement building for my first give-away. The folks at Sew Mama Sew are sponsoring a mega-giveaway opportunity which I am participating in. They will have a master list of giveaway participants and you can go to each site, leave a comment and be eligible for fabulous handmade items and supplies. I will be listing my giveaway item (think summer, sea maven, beads and magic!) on May 27th, so come back and leave a comment. I have been wanting to make some changes to the look of my blog, so I spent some time today making a new banner. This is a funny bird sculpture that I made, mainly out of felt with some embroidery. I also changed some of the colors to get a cleaner look. I spent time looking at blogs I really love looking at and clean and uncluttered seemed to be my consistent theme as I made notes. So, here it is. We are finally in Wisconsin and settled a bit. Time to get back to blogging. We are staying temporarily in Menomonie, my hometown, which I have been away from for almost 30 years. Some things are the same yet it has changed drastically. The neighborhoods are still tidy and picture perfect and the downtown is struggling to make a go of it. I did find a quilt shop, which has been open for about eight months called Stitch and Rip. The owner, Saundra, is very nice. I took my dolls and embroideries to show her today and she asked if she could display them, so they are happily watching over the place. Turns out she lives just up the street from my parents. After having been in Virginia for so long it will be interesting to see how location will affect my work. I did an etsy search one day a few month ago of Wisconsin and Minnesota artists and found myself liking so many more things than normal. I realized I have a midwestern aesthetic (at least that was my conclusion), so I wonder what the differences will be in the reaction to my work. Time will tell and I am excited to get on with it!